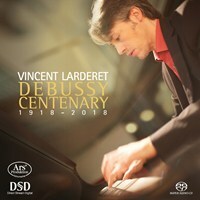 In celebration of Claude Debussy’s Centenary in 2018, the French pianist Vincent Larderet presents a recording of three masterpieces: Images (Book I), Préludes (Book II), and the world premiere recording of André Caplet’s transcription of the Symphonic Fragments from Le Martyre de saint Sébastien, revised and completed by Vincent Larderet. 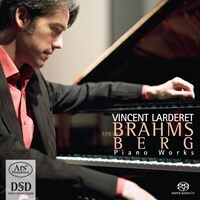 Following three highly acclaimed recordings that won 23 awards worldwide and were nominated for the prestigious ICMA Award, ARS Produktion presents an 80-minute album by a pianist whose interpretations have been compared to legends of the piano such as Michelangeli, Arrau and Zimerman and who was praised for his “astonishing range of pianistic colours” (PIANO News, Germany). 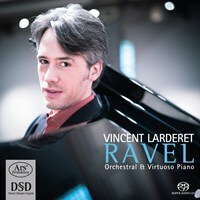 Mr. Larderet is the Artistic Director of the Piano au Musee Wurth international festival in France, and in 2014 was appointed “Honorable International Artist-In-Residence” of the Hong Kong Music and Performing School. 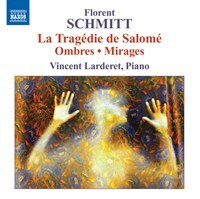 Le martyre de St. Sebastien: Fragments symphonique (arr. V.
If you like Debussy Centenary, please tell your friends! You can easily share this page directly on Facebook, Twitter and via e-mail below.